I know I’ve been a little slow on posts lately and I do apologize. At first I thought I was short on time yet I’m making food almost daily. It’s really just that I’ve been so pre-occupied with baby preparations that I’m not over-flowing with ideas, ones worthy of posting. I’ve been going through old recipes a lot, mostly because there are ones that are comforting and re-assuring. 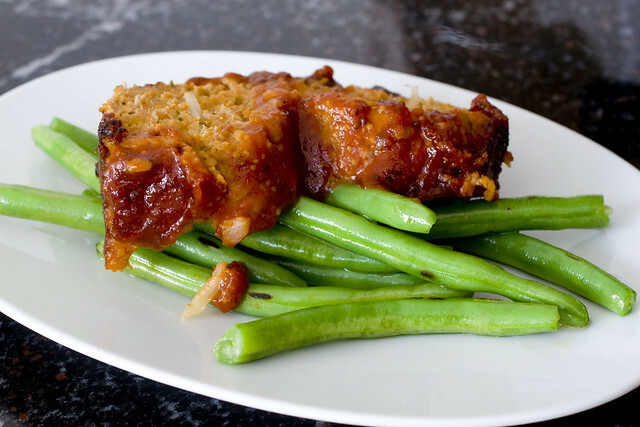 If you’ve been following FoodMayhem for a while, this meatloaf may look familiar. It’s actually a tweaked version of one I made in March of 2008. When my cousin Olivia brought me some fresh Rosemary, my mind immediately wondered back to this recipe from almost 3 years ago! That tells you something doesn’t it? I made a few changes and now, 100% turkey, I consider this to be an improvement (besides how embarrassing my photos were back then). 1. Preheat oven to 375 degrees. 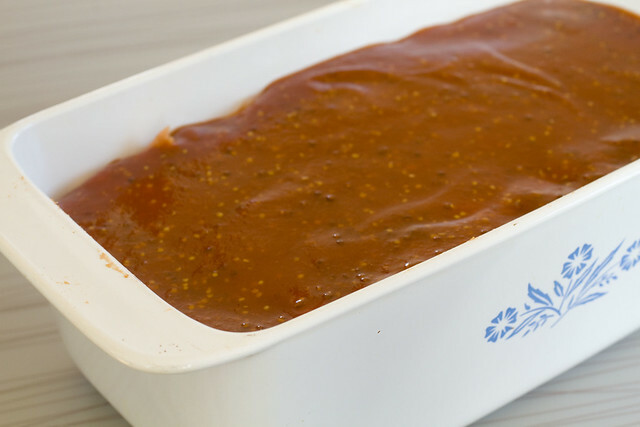 Prepare a 9×5 loaf pan with non-stick spray. 2. Combine turkey, 1/2 cup tomato puree, bread crumbs, onion, egg, rosemary, salt and pepper. 3. Press into the loaf pan. Make an indent along the center, like the shape of a perfect pound cake. Set aside. 4. Stir together 3/4 cup tomato puree, brown sugar, vinegar, and mustard. Pour evenly onto the meatloaf. 5. Bake for 55 minutes. Let it sit for 5 minutes before serving. *Left-overs should be covered and stored in the refrigerator. You can re-heat in the microwave. posted by jessica	at 12:09 PM	Filed under American, Recipes. You can follow any responses to this entry through the RSS 2.0 feed. Both comments and pings are currently closed. i like the inclusion of rosemary–it’s such an aromatic herb and it brings so much to a dish! i like the way you’ve shaped the loaf too–very clever. 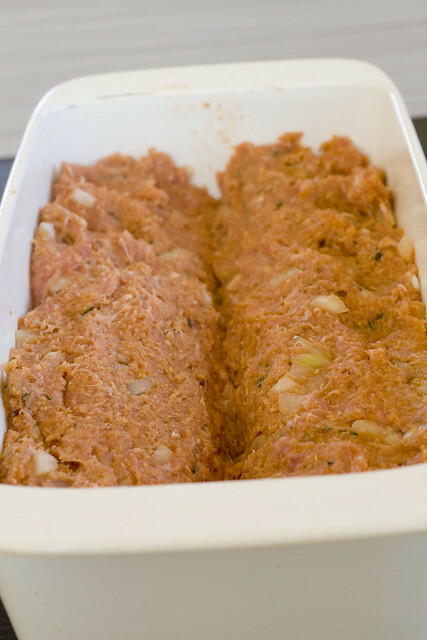 When I wanted to make meatloaf, I tried searching online to see if anyone made it in a loaf pan. I’m assuming that’s one of the reason why it came out moister than just free forming and baking on a cookie sheet. I wonder if I can fool the hubs that it’s beef lol Either way, it looks darn tasty! Is there a reason for the indentation? I don’t have any baby stuff done yet…I’m staying with my parents for a few weeks after she’s born so he has time to set some things up at home while I’m there. Wonders, you can go part beef, part turkey if you want. The indentation allows for more sauce distribution. We’ve tried to prepare all the baby stuff ahead of time. 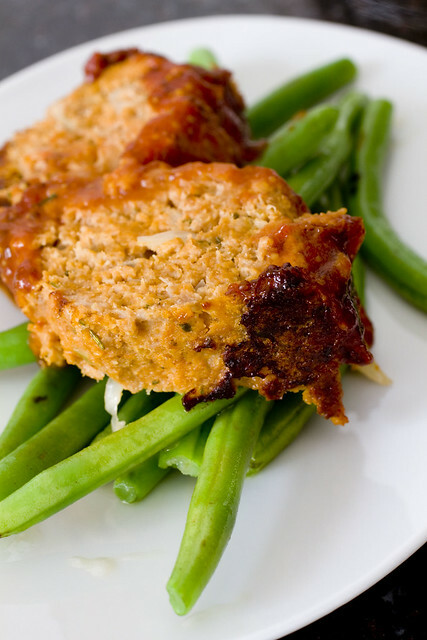 Your meatloaf does look pretty! I made this last night and it was SOOO moist! It was so good that my husband and sister were literally bouncing with glee (they both do that when they really like what they are eating). Thank you! or …………………………………………………………………………………………………………………………………………………..My prior meatloaf recipe left something to be desired. Looks very tasty. My husband would love this. The sauce that you used sounds like a nice variation from the standard ketchup sauce on top. I made this recipe last night for 6 people, 3 being children, and everyone loved it. One thing I changed though, is I only used the egg white. I will definitely be making this again. Chance, that’s great! Good to know it also works with just egg white. What kind of mustard did you use? Christina, you can use any plain prepared whole grain mustard. I think I used the Maille brand. 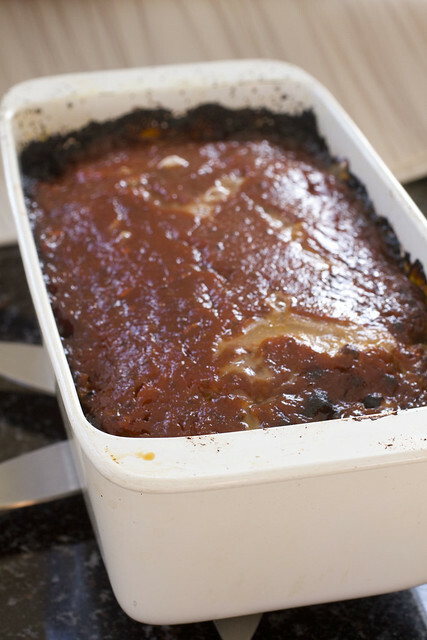 I can’t wait to make this meatloaf. You have a great blog, thanks for sharing! Hi, Am not sure if this will fly since I am not putting my mailing address, and no email address is requested. Upon looking at Google, I came upon your recipe for Rosemary Turkey Meatloaf. Since my rosemary plant REALLY needs to be pruned, this recipe really got my attention. Am going to make it in a few minutes, but do not know how to let you know about the results. Thanks for sharing this. Corinne, I think there is a place to put your e-mail address. I’d love to know what you think of this recipe and if you want to share a pic, that’s be even better!